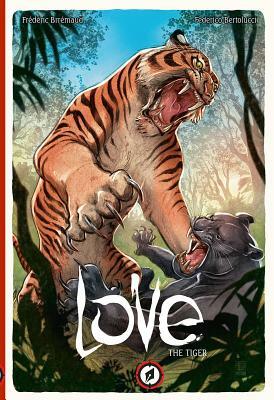 A day in the life of the king of the jungle, this lavishly illustrated story follows a single majestic tiger through a wordless adventure of survival as it hunts prey and defends itself from other would-be killers defending their territory. This exciting tale is told without narration or dialogue, conveyed entirely through the beautiful illustrations of Federico Bertolucci. A beautiful, all-ages title that explores genuine natural behavior through the dramatic lens of Disney-esque storytelling. Like a nature documentary in illustration.